As part of our 30th anniversary celebrations, we asked our people to share why they love working here. The answers were honest, inspiring and funny. We hope these stories show what an amazing and varied team we have working here and you enjoy reading them! As part of Ward Hadaway’s 30th anniversary celebrations, more than 50 of our people will team up this September to run a non-stop relay between our offices in Manchester, Leeds and Newcastle – all in the name of charities COCO and Greggs Foundation! Commercial law firm Ward Hadaway has marked its 30th anniversary by being named Law Firm of the Year at the annual Northern Law Awards. Ashleigh Chisholm joined Ward Hadaway on July 25th, 2005 as an Administration Assistant in the post room. She said: "I joined Ward Hadaway via Key Training to do an NVQ in Administration. I was 18, so it was quite daunting as I felt like I was going into the unknown. "I received huge support in the early days however thanks to my former supervisor Jacqui McArthur. She spurred everyone on and that's how I ended up in the Business Development Team. "I actually wanted to be a sports journalist because of my love for rugby, but my grandad persuaded me otherwise and convinced me to apply to Key Training. "On my second day at Ward Hadaway I found out that we were sponsoring the Newcastle Falcons rugby team. My family and friends were convinced that I'd only taken the job because of that! "Things that stand out for me include the annual kicking clinic event where clients took their kids along to the Falcons to have a kick about with the rugby players. I remember one year they ran out of food and Jonny Wilkinson had to make do with three potato wedges and a banana! "And then there was the opera singer who sang in the car all the way to our client event at Bishop Auckland Castle." Ashleigh reflected on the goodies Ward Hadaway has given away over the years. "We've given away everything from branded Yo-Yos to Kit-Kats, lip balms…and even gin and tonic over the years," said Ashleigh. 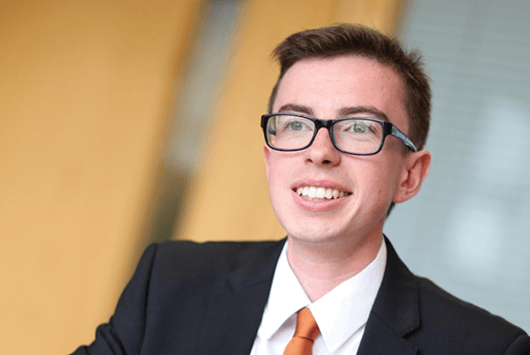 Apprentice Danny Costello joined Ward Hadaway in 2014 as a Business Administration Apprentice, quickly progressing to become a Paralegal in the Property Team and attributes his early career success to the knowledge and support of his colleagues in the Manchester office. "On my first day at the office I found everyone really easy to get on with, people were so welcoming and the biggest thing I noticed was that everyone was treated the same at all levels. "We are all very close in the Manchester office and it is a great working environment to be part of. I've never felt on my own and I've always been safe in the knowledge that I have countless mentors and colleagues to call upon for their knowledge and advice. "Because of the way I've been welcomed to Ward Hadaway, I have a real desire to give something back and also something to share with other students who are just embarking on their careers. I've still a long way to go, new milestones I'd like to reach and new things I want to learn. However, I'm confident I am exactly where I need to be to achieve that." Going where life takes you has proved a successful strategy for our Head of Private Client unit and proud Yorkshireman Andrew Facer, who joined the business in August 1992, after working in both the City of London and Manchester. "I had been employed in London and my daughter was only a month old when my wife Sarah and I decided to up sticks for a new life in Newcastle. I had no idea what to expect as despite my parents living in Scotland at the time, I'd not spent time in the city, although I'd heard it was a good place to bring up a family. "Being able to work as a specialist caught my attention too. My gut feeling told me that if I wanted to move North, it was now or never. Long story short: I signed my contract and going with my intuition really paid off! "It was the quality of the people and the fact it was a firm I believed in that swung it. Back then, there were only eight partners and it was like working for a firm with a lot of mini businesses within it and everyone supported each other. It was nimble, dynamic and fun and I've dressed up as a banana and a Christmas pudding for our work parties." "The one thing that stood out from the beginning for me was the very close nature of the firm's people. It was a very comfortable and supportive place to work and somewhere you could progress. As the firm has grown, it has matured and become more regulated, but it still has a friendly feel to it. "Just like the previous generation grew the business for us, I now see it as my obligation to ensure Ward Hadaway continues to prosper in order to pass it on to the next generation." So what's the first thing that comes into Andrew's mind about Ward Hadaway? "Succession planning, fun and different," said Andrew. When Public Sector Paralegal John Hendry joined Ward Hadaway in August 2016, he was impressed with the firm's client base and also how friendly its people were. "Apart from the people aspect and the firm's reach, what I love most about my job is that it's challenging and somewhere I can better my knowledge. When I joined the firm, everyone was happy to help me settle in. "Our Head of Commercial, Colin Hewitt was particularly welcoming. He also ensures we all get together outside of the office to help the team gel. I am also a member of the firm's running club which has helped me get to know people from right across the firm better. "Every day is different at Ward Hadaway and I'm never bored. It is busy, though. Apart from my day-to-day work, I also get involved in charity work. Recently my colleagues and I took part in the London Marathon in aid of the Teenage Cancer Trust. We raised £2,500 all together as a result. "Since I joined Ward Hadaway I've seen Martin Hulls appointed as new managing partner, moved teams from Coco to Pubco, secured my role as a future trainee and seen the country vote to leave the EU. Exciting times! "Probably the most memorable moment for me was back in November 2016 when I cheated in the Great Legal Bake. To cut a long story short, I ran out of time, so for fun I bought a chocolate log from Tesco, decorated it and ended up beating two other people taking part! I have never been allowed to forget it"
So what's the first things that comes into John's mind about Ward Hadaway? "It's an excellent place to work, great service provider, has dedicated staff, obviously blue and yellow and most importantly, it's a law firm that has given me a career!" Jamie Martin, Senior Partner at Ward Hadaway, added: "I applied to Septimus G Ward and Rose for articles (training contract) in 1977 and was unsuccessful, so it was a great feeling to return in 1996 by joining Ward Hadaway (through the merger with Wheldon Houlsby and Scott and to become managing partner in 1998, a role I held until earlier this year when I handed over to Martin Hulls when I became Senior Partner. Michelle was 24 when she joined the firm as a Marketing Assistant after a stint travelling the globe, temping and working as a PA to the Director of Finance and Director of Nursing for South Tyneside NHS Trust. She said: "I just thought it was time to get a proper job! I'd just moved in to my new house when I got the call to say I had a job and remember dancing around the room. "There were only four members of the team when I started working in marketing and it was more of a supporting role back then. Over the years, I became gradually more and more involved in everything and even hired the two Steph’s who now work as Managers in the team. "Things that stand out include trips to Dublin and parties! As a firm, when we get together we definitely let our hair down. "I also remember the opening of the Leeds office in 2008. We held and event with a magician and a string quartet at a restaurant near the canal and not far from our new home. "One of my favourite memories was the Magic of the 80s concert at Alnwick Castle. From start to finish, we all felt a sense of achievement that day seeing the lawyers and their clients enjoy themselves. "Working in marketing certainly isn’t glamorous as we also had to look after the posh porta-loos we provided at the event to ensure they were only used by our clients and not the public – turns out I’m quite a good loo attendant!" "I joined Wheldon Houlsby & Scott in August 1991 as a temp secretary working in the Family Team for Tim Scott in South Shields. After two days, I was offered a full-time position. "It was a very busy office and everyone was very friendly. It was a real family firm. Everyone knew everything about each other. It was a very happy place to work and even to this day, I still keep in touch with a lot of the staff. "We worked on computers for letters and file notes, but we had to use a typewriter to fill in forms like divorce petitions. "Wheldon Houlsby & Scott merged with Ward Hadaway in 1996 and in 2000 I moved to the Newcastle office with Tim Scott. Life was so different in Newcastle. I had to get used to working in an open-plan office. I soon settled in though and met many new friends..
"George Scott was the Managing Partner when we merged, followed by Peter Allan. Jamie Martin then took over the reins until recently. I have worked with Jamie since I started in 1991. My youngest daughter was born around the same time as Jamie's son. We are also both Sunderland supporters for our sins! "In September 2008 Tim Scott retired from the practice and I moved departments. I have worked in the Commercial Litigation Team since then and I work for Tim Toomey and Robert Glassford now. "When I first came to the Newcastle office, we had not long moved from Hood Street in Newcastle city centre to Sandgate House on the Quayside. Thankfully I didn't have to work through the loud drilling while they put posts in the river for the Millennium Bridge! The work was completed just after I moved. "A few years later, Keel Row House was opened. "I have seen many changes since I joined. Gone are the days (thankfully) when I had to plough my way through tape after tape of dictation. Many a time they were accidentally wiped off and I had to go and grovel and apologise to whoever's tape I had deleted! It's a relief having Big Hand – no more losing dictation. "Over the years I had accounts training going from the old system SOL to CMS. I have lost count of the number of training sessions on Word, Excel etc. I've undergone over the years. "I have enjoyed many nights out both in South Shields and Newcastle since I started. "One episode with the staff in South Shields was for someone who was leaving us. It was a nice summer's night. After a lot of drinking, it was decided we all go to Bents Park for a takeaway curry. Needless to say we all had to bin our clothes the next day as they were ruined with curry sauce. "I remember "It's a Knockout" when I nearly knocked myself out on the water slide. I sat at the top of the slide and banged my head on the ground. I then fell off the bouncy castle and to top it all I nearly broke my neck running to get to the changing rooms first! "All in all, I have had some very happy times with Wheldon Houlsby & Scott and Ward Hadaway. So what's the first thing that comes into Margaret's mind about Ward Hadaway? "I have been here a long time and I cannot imagine myself working anywhere else." John Murray, Executive Partner at the Leeds office, joined Ward Hadaway on 1st March 2013 after being a partner at another Leeds firm for 18 years. He said: “I was ready for a change; I needed to be part of a larger, more commercial organisation that reflected the work I was doing and the clients I was working with. "My first impression of Ward Hadaway was that it was a professional, forward-thinking firm, but with a friendly, family feel to it; my first impressions were correct. "My first ever meeting was with Martin Hulls, now our Managing Partner. I liked his direct, straight-talking style. "I set up the Social Housing Group at the firm and over the last five years have seen significant growth in our client base, and our turnover. We now have an excellent reputation and some great people in the team too, not to mention the fact that we are a major player in the social housing sector in the North. "In the Leeds office we have some great team-building initiatives through CSR work which has included internal (and competitive!) fund raising, the Leeds Legal Walk, Law Society Events and social/sporting/cultural events with both colleagues and clients. So what's the first thing that comes into John's mind about Ward Hadaway? "A great law firm that I'm very happy to be a part of." Julie Stanton, a Legal Cashier in the Finance Team and Debbie Brewis, a Paralegal in the Property Team started out with the business 30 years ago. They laughed as they recalled working together decades ago. "I was returning home from an interview when I bumped into Julie, an old school friend, who was working for a local solicitors' firm, namely Hadaway and Hadaway. Julie asked me if I would be interested in applying for her old job as they were seeking a replacement following her promotion to Junior Cashier. "I remember the interview well. It was very informal and was conducted by one of the Partners, Mr Horsley, who conducted the entire interview with his eyes closed. He asked me questions such as whether I had any siblings, had I enjoyed school and then when could I start work? Needless to say I started the very same week. That was back in July 1981 and I've never looked back. "I have some great memories following the merger into Ward Hadaway back in 1988 which included a day trip to Scarborough. We all piled on to the bus and away we went. We played rounders on the beach and everyone was given £5 spending money (which went a long way back in the day!) before all piling back on the bus to Middlesbrough where we stopped for a slap-up meal. "We also had some amazing Christmas parties at St James' Park which really broke down barriers and helped bring all new people together. I remember one year we played party games and another we had a karaoke/fancy dress. Andrew Facer wore a banana suit!" Julie added: "It's certainly got busier over the years. "One of the most memorable things since the Quayside office opened was seeing the Millennium Bridge being transported down the Tyne ready to install. We all watched it from the office windows. "Other things include Steps staying at the Malmaison Hotel next door, watching the fans line up outside and seeing Ruud Gullit, who seemed to make the place his home when he was at Newcastle United." 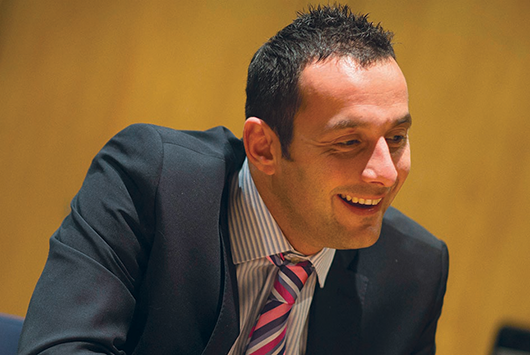 Russell, a Commercial Litigation Partner, describes the circumstances of and inspiration behind his decision to join Ward Hadaway and how he came to build his career here. "I was a second year student at Newcastle University who was working a summer job as a waiter, barman and night-porter at the Malmaison next door when I applied to Ward Hadaway for a training contract in 2002. "I'd grab every shift going there, so much so that I even ended up spending a week working between the two buildings when I later got the chance of some work experience at Ward Hadaway during the following summer. "I even slept and had breakfast and dinner at the Malmaison during that week, such that I didn't actually get home for a whole week! I guess it was like being a corporate trainee all over again! "It was during my time at the Mal that I got to recognise some of the faces coming and going next door, as well as those who regularly visited the Mal for coffee or something stronger! I knew pretty quickly that I wanted to work at Ward Hadaway and when the opportunity arose through a subsequent invitation to participate in their graduate recruitment process, I really enjoyed the open day too. "My subsequent interview however nearly didn't happen as I only narrowed avoided being run over by one of my interviewers outside of Sandgate House. She was Head of HR at the time, so it made for a very awkward ice-breaker (for her) when she realised why she recognised my face at the start of my interview. In hindsight, maybe that is why I got the job, especially when my ice-breaker involved me having to admit that I had inadvertently thrown a drink all over Sir Bobby Robson during the previous evening's service at the Mal. He still tipped me though, which hopefully says more about him and the person he was than it does about me. "My recollection is that there were only 250 people working for Ward Hadaway when I subsequently joined the firm as a trainee in 2004, so it's grown massively in size and stature since, both as a firm in its own right (especially with the opening of the Leeds and Manchester offices) and also with the Quayside having been so extensively developed to the point where it has become such a prestigious and iconic place to work. "Having spent the last five years working between the Leeds and Newcastle offices, it has been also interesting for me to watch the Leeds office evolve and grow in much the same way as the Newcastle office has evolved and grown over the last fourteen years. "So what's the first thing that comes into Russell's mind about Ward Hadaway?" Well aside from some of my case highlights, the umbrellas which get everywhere (including making their way to the Open on an annual basis) and the regular question of whether I am related to the Ward of Ward Hadaway, it has to be the sticks of rock which we used to take to graduate recruitment fayres. They were so hard that I broke a tooth on one of them. Fortunately they have since been disposed of and another positive over the years is that we have now upgraded from the flimsy pencils which used to break to pens which actually work. If anybody is still wondering, I am not related to the Ward of Ward Hadaway or certainly don't know that I am in any event. "Having been here fourteen years now, I just feel that Ward Hadaway is somewhere that has a sense of belonging and a camaraderie and that there's genuinely no place that I would rather work as a lawyer."